I got one of these 'pop' injector testers, but the owner's manual is in polish. What type did you get? Do you have a picture? Possibly locate a polish national? My limited understanding of any pop testers function is to take injector up to spray or release pressure and observe pressure gauge for point of fuel release. Next observation is to study spray pattern for uniformity. Watching for any leakage prior to the injectors release pressure as well. The instructions may contain some information on modification of injector release point by changing internal shims. This may not be the information you are looking for though. If I am wrong I do not mind someone correcting me. Importance of keeping tester clean internally and using really clean fuel to avoid getting dirt into injectors under test probably is stressed as well. Last edited by barry123400; 05-17-2005 at 02:37 AM. One thing I might add that you probably already know is, dont get your fingers under the spray. Read the factory shop manual for your car. It has an in-depth section on cleaning and setting injectors. I posted to a similar thread recently with some links to some of my favorite threads on the subject. Good ventilation, don't breath the diesel you spray. I do pop testing with corn oil. It's safer and doesn't stink. The oil and injector temperature can vary your pressures by 50 lbs, so start with both at a known (room) temperature. Pump the injector till it pops 2 dozen times just to clean it out and get it stabilized. Then pump with rapid hard movements and look at the spray pattern. It should be a fine narrow spray jet, not a squirt. I also use the rapid pump to determine the pop pressure. The pressure guage needle should be bouncing around the pop point. Some folks use a slow pump to determine pop pressure. Just be consistent when you're trying to match pop pressures. Squirting is most often caused by having the tiny cross flow hole in the tip of the nozzle plugged. Take it apart and clean it again, use a fine nylon brush bristle or a fine brass wire to poke through the cross flow hole. You must clean everything like it was a NASA project- and bits of dirt can mess things up. Soaking the nozzle parts in corn oil and scrubbing with a toothbrush seems sufficient for cleaning. Varnish and and carbon should be cleaned off completely. I also use ethanol for cleaning, but corn oil the parts before assembly. If the pattern is still no good, it's probably time for a rebuilt nozzle. I only bought a few spacer washers and then used a diamond hone to get the sizes I needed. You'll need a micrometer to measure the washers. 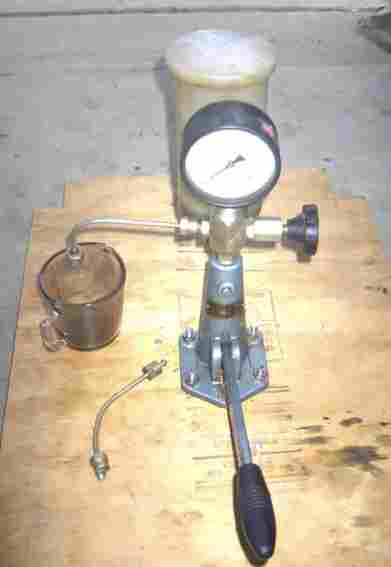 My pop tester was homemade from a grease gun, grease gun hose, some hydraulic fittings, and an injector adapter made from an old injector line end with fitting epoxy steel'd into a drilled 1/4 NPT plug. I found it fun and very satisfying to match my injectors. My idle is now very smooth. Last edited by BruceMcC; 06-17-2005 at 12:55 PM. Mr McCreary, that homemade injection tester is very impressive. I think that it is the best that I have seen. I hereby award you the official TwitchKitty Keep it Simple design award for simplicity bordering on elegance, congratulations. Keep up the good work. In the manual (FSM) there is one test that requires you to close the valve to the gauge. If you refine your design you may want to incorporate that feature. I recently acquired a pressure guage with a max pressure hold needle on it..should make matching injectors at home easier....its about 4.5 inches across. boneheaddoctor Oh please do tell us where you found such a great gauge and if you know I would be forever in your debt for the part # I have found similar gauges but never with the range I am looking for. here's a picture of my injector tester. I've played with it the other day, Here's what I've noticed. I can pump up the pressure, then use the know on the right side to slowly increase pressure until it "pops" This to me seems a little more accurate than moving the handle up and down to build up the pressure to pop the injector, with the knob, there is no vibration and the stream of fuel is easier to see. corn oil, hmmm gonna have to consider using that. I, too, use Mazola (due to wife's objection to diesel smell). I adjust my shims, but I use a belt sander and a home made jig. Every .05 mm on the shim adjustment makes ~ 3 bar difference in "pop" pressure. I use a .10 mm endodontic file to clean the nozzle holes (carefully) . My home made pop tester is not as elegant, but does have, what some have called, the "California Twist" to the injector line. And my name is Bruce, also. Bruce, Your hydraulic jack based pop tester is a work of art. I took the lazy way out with the grease gun. Nice job, both of you! Have either of you had problems with injector fouling from dirt while testing? The reason I ask is the commercially available testers have filters built in and I'm wondering if they are really necessary. I assume you must thoroughly flush out your homemade tester initially. I never even thought about filtering and cleaning. I made Bruce's design from a grease gun with corn oil. Just built it and used it, worked fine. I do keep the top covered when not in use though. 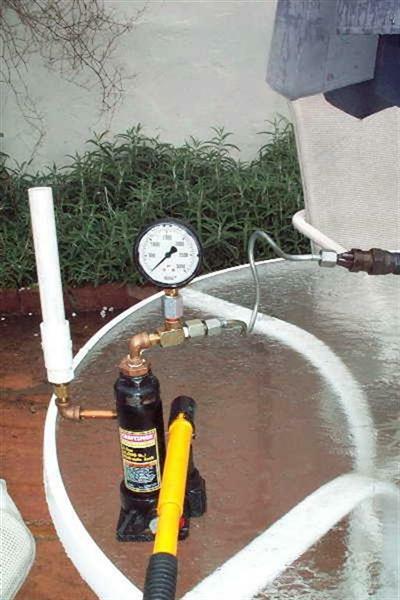 Also an alternative to a pressure holding gauge. You can use a grease fitting at the gauge. That will act as a check valve and hold pressure. Would you guys mind explaining how you made those wonderful devices? I'd really love to be able to set my own injectors. That way I know I've got them right.